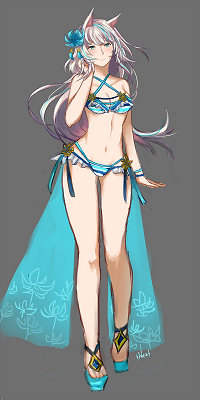 As summer ends, our newest mercenary wants to show of her summer wear. Being 900+ years old didn’t harm her beauty as expected from a magical fox. Beauty doesn’t tickle your fancy? What about power? With this awesome skin she can have two great stats like %def ignore or %attack power at the same time. If her assets don’t bring the enemy to their knees her whip will make sure they do. What are you waiting for? Don’t miss the chance to obtain her costume NOW! Credits to MidnightWalk for designing the costume.